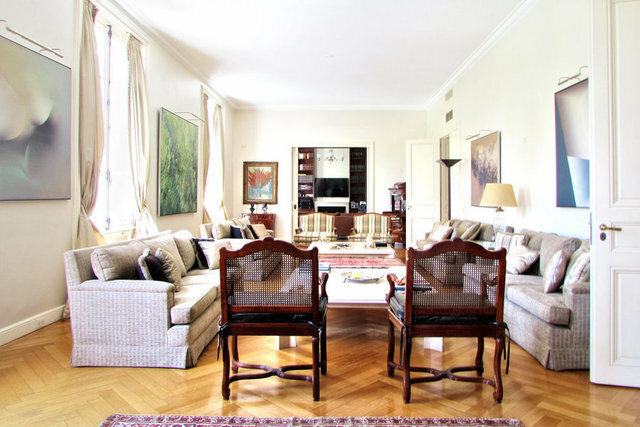 This exclusive 600 sqm apartment is located in one of the most important and refined buildings of the Recoleta neighbourhood. It was built by the well known architect Alejandro Bustillo. It is an exclusive six storey French building where Adolfo Bioy Casares, the well known Argentinean writer, once lived. You enter the apartment to find an important reception composed of a large distribution hall with a fireplace that leads to a double living room, dining room and sitting room all overlooking the park. Its Slavonia oak flooring, original bronze fitting, fireplaces and double height ceilings stand out. Through a distribution corridor we access the private area: a large master suite with marble bathroom -recently renovated - and a dressing room, three more bedrooms one of them en suite and the other two share a bathroom. The service area comprises a spacious kitchen with very good light and a large breakfast table. Laundry. The rooms in the service quarters sector have full bathroom. The heating system is provided by the building through radiators. The unit has 3 storage rooms in the top floor and two permanent parking spaces in the ground floor. 24hs Security. *The measurements, surfaces and expenses shown in this sheet may not be accurate. The definitive data comes from the title deed and the corresponding vouchers.